Many people have asked me to write this book: After a sleepless night beset by the twittering of sparrows and starlings, and gentled by the coo of doves from the cowshed roof, the morning chorus bids me rise and start to write. 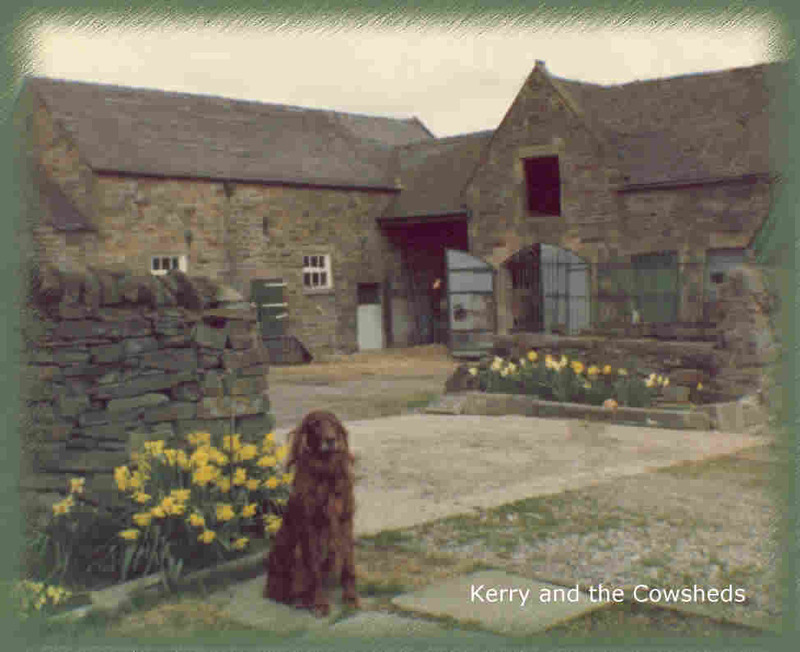 Kerry Gold our lovely red setter dog is asking to go outside. I must make a cup of coffee, see how yesterday's new calf is. What are those woolly jumpers, the sheep bleating at, a fox or a stray dog perhaps? Alas, being a mere woman I feel genius is already getting spent, ere I put my pen to paper. I will just stir the banana wine and thank God it rained so I cannot go raspberry picking today, so I had better get writing. What shall I call this book? It is about survival in its many aspects, the strength and brightness of the human spirit, which enables us to come, through trauma and live in hope. For them and for all survivors I shall call my book. "Reach for a Rainbow" as life indeed, is sun filtered through the rain, a vision, and a rainbow in the sky. I am sure that all families will be able to Identify with our struggle to help each other through desperate circumstances. Thirty eight days shipwrecked with my family, alone in the Pacific Ocean. Our strengths and frailties exposed, stripped of everything but our fierce determination to survive and bring our children home, and there to live ever after with the trauma of this experience. Come with me to the Pacific wastes, and I will tell you of how I drew from the wealth of experience in my childhood and early motherhood on a farm, and how these memories constantly sustained my courage and spirit to carry on and finish what we had started together. We could not end our children's lives there in that little boat! The dirty bilge water swilled over the cabin floor where I lay: black and evil it streamed, a mixture of seawater and diesel through my long fair hair. I opened my eyes; the long miserable night was over! The blue linoleum with its brass fastenings on the floor was still there, only in close up. Lucette had been slattering about as if she didn't want to go anywhere eith er. The aftermath of a rough night's sailing strewed the floor, waiting for me to clean once more. So much useless effort and I felt very tired. It had been impossible to sleep in the bunk. Rolling and pitching in the heavy seas on our first night out of the Galapagos Islands had left me feeling very sick and the floor was still coming up to meet me. I struggled to stand up; I lit the paraffin stove to heat up the cold rice left uneaten from the previous night. 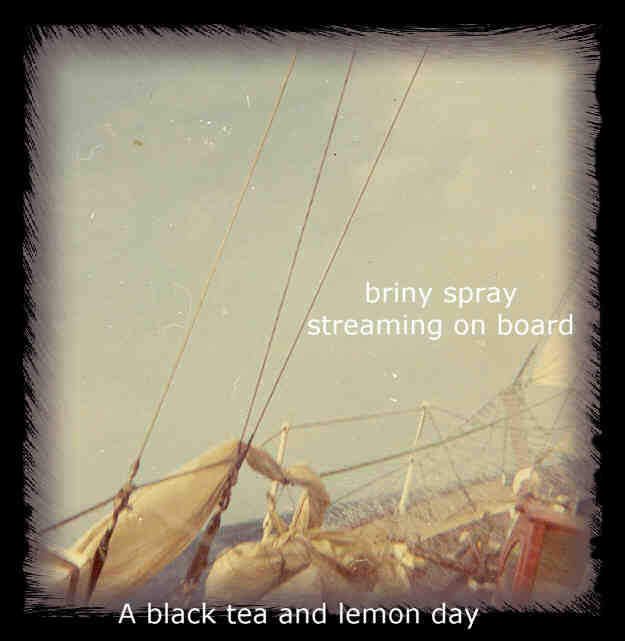 It smelled vaguely of paraffin, but they would eat it if they were hungry and no one would complain, but it was definitely a black tea and fresh lemon day for most of us. I cleared the galley area, washed my precious kitchen knife, carefully placing it on the blue Formica top. I wondered who would be the next person to take it away and lose it once more. It was almost I0 o'clock and not a glimpse of sun that day. Dougal my husband was up above trying to take a sight. He came below to work out a position and as he passed on his way to the aft cabin he put his arm around me and said. "What's the matter Lyn?" "I feel as if I don't want to go any further, not even an inch." He reassured me with promises of better days to come, sailing the Pacific Ocean in the ease of the trade-winds. Our next port of call the beautiful Marquisa Islands, Tahiti, and then hopefully finding work in New Zealand. I had always worked. Years and years of it, and had recently completed six months at the Cedars of Lebanon hospital in Miami, where I was on night duty; in charge of the delivery unit. I called to Neil and Robin who were resting in the fo'c'sle bunks, something for them to see I thought, as I started to clean my teeth. A sudden shuddering crash from beneath my feet as a jet of water hit the ceiling with great force, and then came down on my head. I screamed, as I gazed in horror at the blue sea pouring through the hole at my feet, along with bright daylight. Lucette seemed to have come to a jarring mind bending stop. I ran, closing the toilet door tightly behind me. 'We're sinking!' I shouted to Dougal as with all speed I hurried Neil and Robin (our extra passenger) on deck. I felt electrified into action almost as if I had known we were going to sink. I went aft to the top drawer of the bunk where I kept all the valuables. "No! Wait for Dad"I gave out the life jackets as Robin called, "What can I do?" "Guard this with your life," I said as I gave him the five-gallon drum of drinking water. I heard cries of "Where's Dad? Where's Dad?" Hell! Where was he? "Dougal! Dougal!" 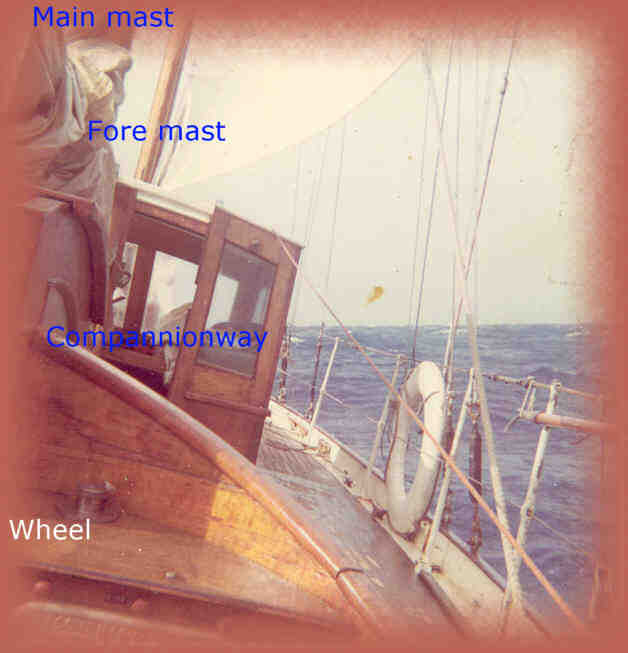 I shouted down the companionway "Come quick she's going." I looked down into the cabin; there he was chest deep in water, wading slowly towards the bottom rung of the steps, and wonder of wonders! He held aloft the precious knife. I breathed a great sigh of relief at the sight of him. l"Are we sinking Dad?" said Douglas "Yes son, I'm afraid so" came the reply. 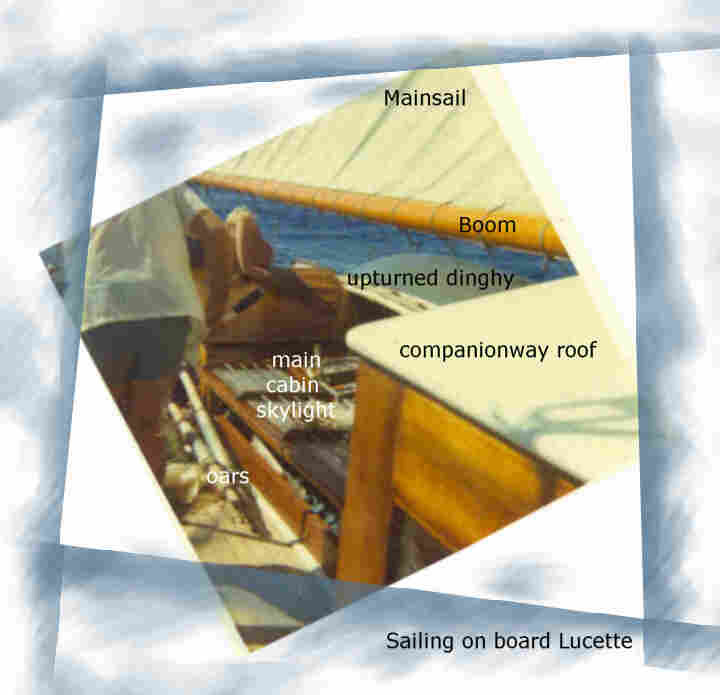 Douglas heaved the life raft over the side of Lucette. Dougal cut our dinghy the Ednamair, free.I stood mesmerised for a moment as if watching a film unfolding in slow motion. "Mum the teddy bears got drowned." Neil was back in the sea. The deck was awash now. Lucette's bow was disappearing fast. I struggled to climb over the rails but neither of my legs would go over. I looked for Dougal. There he was standing in the water at the bow, his back towards me, and in a loud voice declared, "Abandon Ship!" As he slipped into the sea, I thought, as the water took me roughly through the rails "but there is no one aboard!" I swam towards Neil. My toes curled under as I thought of the possibility of the Killer Whales amongst us. I reached 'Ednamair', (the dinghy) to which Neil was clinging and Robin holding on to the painter, I was using my arm to hold on when Dougal called "No, not there, you'll swamp it." I looked around, "Well where the hell else could I go?" I thought, the Pacific's a big place. First wave on the left or what! I looked back to Lucette but she had taken her final curtain and sailed straight on under the sea . Poor noble Lucette, she had given us time to get off and taken with her our talisman, the caul of a baby I had once delivered; it had been given to me by the mother at my request. 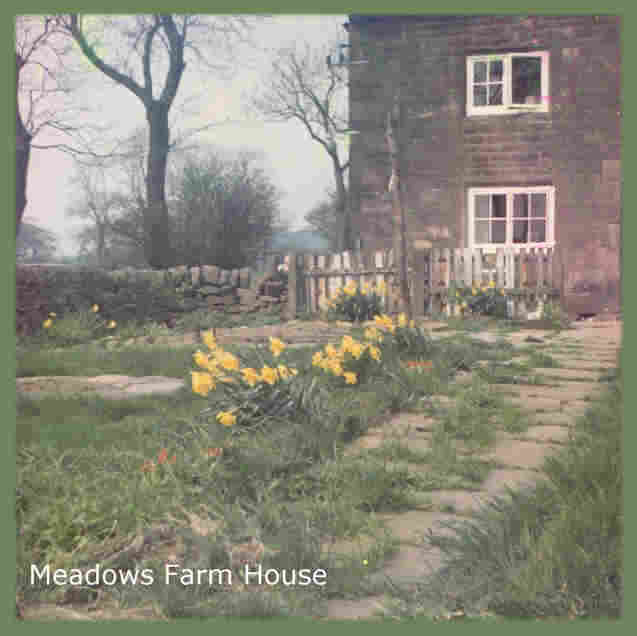 It had dried a paper thin membrane hanging on an oak beam in our old home at Meadows Farm. A long ago superstition of fisher folk, whose belief it is, that you will never drown at sea if you carry one. 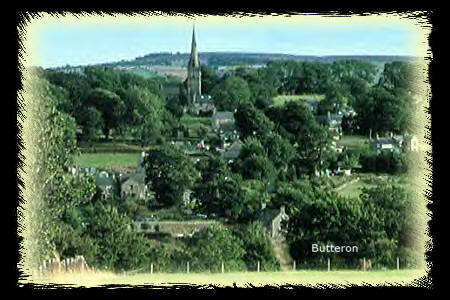 I thought of the story of my own eventful birth at a place called Butterton on the Staffordshire moors. My mother told of how father was working nights at the copper foundry, while her sist er and a neighbour stayed with her. It was dark when mother went into Labour, and her sister and neighbour were both too frightened to go alone to fetch the doctor. They walked four miles together leaving mother alone with two little children and me, who arrived quite unaided into this world; 'Bawling my head off' and still attached to my mother, had made my own way to the bottom of the bed taking half the placenta with me. Old Dr. Hall arrived by horse and carriage having stopped at the Vicarage to pick up Mrs. Chestle who assisted with his midwifery cases for a charge of thirty shillings. He found mother lying in a massive haemorrhage too weak to move. This was my first lesson in how to fend for myself. The caul had had served its purpose and here we all were. Dougal at the opening of the rubber raft, directing the traffic I thought as he called. "Send Neil across! Now you! Now Robin", and he fastened the dinghy painter to the raft. We were all together again. Oh! Where was Douglas?The last time I saw him he was about to put his finger in the exhaust valve of the raft (where the excess air was escaping with a loud noise) and he had called frantically to me, "Mother! Give me a patch"
I looked round the ocean for something that would do. I said "Will this do?" as I threw him an orange, he gave me a look as if to say "Only mother would be stupid enough to give me an orange"
"Douglas!" "Douglas! "We all shouted and he came to the entrance with his beaming face alight,"Look what I've found,"
Treasure indeed. I thought as he produced a spool of fishing line to which was attached the Genoa sail, washed off Lucette's deck. We were all togeth er again in our new home Robin had gallantly offered to go after the water drum but Dougal had thought it too great a risk and we sadly watched it float away into the distance. Killer Whales" someone said, "thirty of them!" " One came up bleeding from its head! "; "Perhaps the others have eaten it!" "I hope so" Sandy remarked. "I wonder if they are still outside." 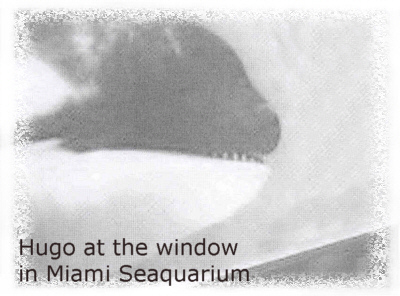 We stopped speculating and I remembered eerily the cold feeling of close eye contact with a Killer Whale, through the viewing window at the Miami Seaquarium it looked as if it was saying, "I'll get you for this, this eternal captivity." and I had left with a most uncomfortable feeling for it's lost freedom.